Has There Ever Been an Actual Case of Someone Being Pelted With Tomatoes During a Performance? 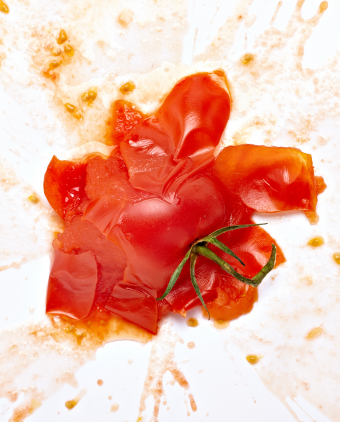 Andthen2 asks: Has there ever been a real case of someone being pelted with tomatoes during a performance? As we’ve discussed in detail before (see: The Curious Case of the Claque), audiences haven’t always been kind to performers throughout history as evidenced by the fact that there was a thriving industry of people who made a rather lucrative living during the 19th and early 20th centuries by simply booing plays and operas unless the actors paid them to stop. But the question at hand is: Did audiences ever go further than this and express their dissatisfaction by pelting the performers with rotten fruit as countless TV shows and movies have depicted or is that simply a fictional plot device? Despite the idea of rotten tomatoes being synonymous with a poor performance to such an extent that one of the leading film review websites in the world is named for it, audiences throughout most of history have thrown pretty much everything at performers but tomatoes. For example, audience members in the cheap seats at vaudevillian shows often liked to chuck peanuts at performers, leading to the creation of the term “peanut gallery”. Long before this in AD 63, it was noted by Suetonius that then governor of Africa and later Emperor of Rome, Vespasian, governed the region “with great justice and high honour, save that in a riot at Hadrumetum he was pelted with turnips”. Fast-forwarding a bit through history, we know it was a popular practise in Shakespearean times to huck various food items at performers at Shakespeare’s Globe Theatre during its heyday. But despite what is often stated, they almost certainly wouldn’t have thrown tomatoes. How can we be so sure? Tomatoes are a “New World” item and they weren’t commonly found in Britain until the mid-18th century. That said, they technically were introduced to Europe around the 16th century, but tomatoes were greeted with disdain and outright fear – rumors even circulated that tomatoes were poisonous. (A similar thing happened with potatoes, with this tuber not becoming widely popular until some clever tricks and antics used by Frenchman Antoine-Augustine Parmentier in which he managed to convince the masses that potatoes were just fine to eat.) So while it’s technically possible that a performer was hit with a tomato at this point (the original Globe being built in 1599), the odds of someone in the cheap seats of a play here having one on hand, let alone enough to pass around to ensure a performer got hit, is highly unlikely and there is no documented evidence of it, despite many claims to the contrary. Lacking tomatoes, a popular missile of choice for overly critical audiences was eggs largely due to them being easy to throw, cheap, smelly (when rotten), hard to wipe off, and perhaps most importantly, infinitely satisfying to land a direct hit with. It’s noted that audience members in the pit at the Globe regularly hurled eggs at actors if they got bored and as a result, Shakespeare often tried to sandwich his more serious scenes with either comedy (often of a bawdy nature) or violence to placate those in the cheap seats so that the show could go on. To find documented examples of audiences throwing tomatoes at performers, you have to fast-forward to the 19th century and travel to America where the practise eventually became surprisingly common. American audiences of this period are noted as being among the “rowdiest of all” and it wasn’t uncommon for them to turn up to performances carrying armfuls of potential missiles (including tomatoes). Much like rotten eggs, rotten tomatoes were cheap in some regions and made for a conveniently proportioned object to throw that also made a very satisfactory splat when the target was hit. Beyond culinary items, American audiences of the age were also known to go so far as to tear up chairs and throw them at the performers if they weren’t happy with the way the show was going. Even on an occasion where the crowd enjoyed a performance, actors and singers of this period still weren’t safe and they’d often be required to “repeat a speech as many times as the crowd demanded” or risk having fruit, eggs, stones, and pretty much anything that wasn’t nailed down thrown at them. John Ritchie… made his debut before a Hempstead audience at Washington Hall a few evenings ago. He had a crowded house, and was warmly received, in fact, it was altogether too hot for him, there being distributed among the audience a bushel or two of rotten tomatoes. The first act opened with Mr. Ritchie trying to turn a somersault. He probably would have succeeded had not a great many tomatoes struck him, throwing him off his balance and demoralizing him. It was some time before the audience could induce him to go on with the performance. He next attempted to perform on the trapeze. As he lay upon the bar with his face toward the audience, a large tomato thrown from the gallery struck him square between the eyes, and he fell to the stage floor just as several bad eggs dropped upon his head. Then the tomatoes flew thick and fast, and Ritchie fled for the stage door. The door was locked, and he ran the gauntlet for the ticket office through a perfect shower of tomatoes. He reached it, and the show was over. This leads us to the obvious question of why exactly did audiences feel the need to express themselves so violently through most of history, particularly when it would sometimes result in the show they paid to see being canceled and even an occasional riot? Mob mentality obviously plays a large role and it has already been clearly demonstrated, both via anecdotal instances and controlled experiments, that people’s behaviour in a group can be strongly influenced by a few bad eggs. In fact, this was the major point of the Claque in the first place. Those on stage found that they could easily control audience reactions by having a few well paid individuals in the crowd set the tone. Humans being humans, the rest of the crowd generally followed, regardless of the actual quality of the show in question. Beyond all this, the idea of a “passive audience” is noted to be a fairly recent phenomenon in theatre and throughout history crowds have always been encouraged in some way to express their enthusiasm, and even sometimes take part in the show in some way, starting way back in Ancient Greece where audience participation in plays and speeches was considered practically a civic duty. The obvious downside of this is that crowds also felt entitled to express their displeasure in any way they pleased. And while the quality of the show on the stage may well have been improved by performers not having to worry about things thrown at them or an audience member running onto the stage, because people were so willing to do this sort of thing, a performer admonishing the crowd for doing this would have been a brave act indeed. Beyond this, the audience themselves didn’t mind as half the fun of going to these shows was interacting with the performers in some way for some (particularly in the cheap seats) and for others observing what certain members of the crowd would get up to during the show. So how did we go from many hundreds of years of audience participation in theatre to the passive audiences we have today, less than a century later? To begin with, shows began shifting from the actors actively acknowledging the audience was there, generally purposefully interacting with them, to instead pretending the audience was non-existent and performing as though what was happening on the stage was real and sort of “in another dimension”, so to speak. Essentially, the invisible fourth wall was created to preserve the illusion, and audiences began to more and more be expected not to break that wall down by interrupting the performance. Other factors that helped this switch along included advancements in stage lighting, allowing for shifting the focus from both the audience and the stage to just the stage, further solidifying the invisible “fourth wall”. Accordingly, theatres were redesigned and rather than having the classic horseshoe shape (so wealthy spectators in the seats high up could enjoy the audience’s show as much as what was happening on the stage, as well as easily observe what other wealthy patrons were getting up to), now every seat commonly faced towards the stage and it became difficult to see what members of the audience were doing. Effectively, the audience ceased to be part of the night’s entertainment. As the show began to focus more on what was happening on the stage, the cheap seats in the pit began to be upgraded from simple wooden benches to plush seats where the wealthy began to sit so they could see the performers better. When this happened, the cheap seats switched to being up high and far away from the stage, where the expensive seats used to be. From this vantage point, it became much more difficult to throw food at the performers, and those wealthy patrons sitting near the stage were less than enthusiastic about getting hit by poorly aimed projectiles, helping to morph the rules to this being no longer accepted behavior in the theatre, though it has persist somewhat in certain other venues. Beyond the occasional heckler at comedy shows, sporting events are another venue that more classic audience participation has endured. For instance, in the early days of baseball, players sprawled on the grass along each baseline with the fans right behind them. This provided fans with easy access to those athletes… Too easy. If spectators didn’t like what was going on, they could scream directly behind the players and also weren’t opposed to chucking objects at them. Dugouts with walls and a roof, located below ground, eventually were created, providing much needed separation. In the 1930s, this type of common audience interaction even led to a fan batting during a Major League Baseball game. 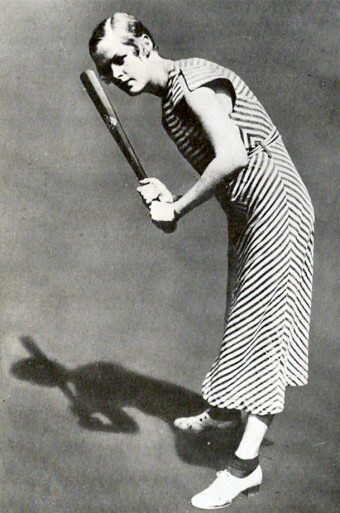 Audience member Kitty Burke, who’d been incessantly heckling Joe “Ducky” Medwick, eventually marched onto the field and grabbed a bat, intending to show Medwick how it was done. Nobody objected and so pitcher Paul “Daffy” Dean threw her a pitch, with Kitty swinging and grounding out. This made Kitty the only woman to bat during an official Major League Baseball game. While a fan trying this today would soon find themselves the recipient of a night in the Clink, the boisterous behavior of patrons at many sporting events still often resembles that of audiences through most of history. But due to stricter rules and that the rowdier members of the crowd are typically further from the field of play, this doesn’t usually disrupt the sporting spectacle, though the athletes still have to endure non-stop taunting or cheering (and the occasional projectile) in many professional sports from fans at all levels. Of course, it is not uncommon to have a (often inebriated) fan running onto the field of play and being chased around by security. Despite this interrupting the show the rest of the audience paid to see, everyone tends to cheer for the runner and find the whole thing thoroughly enjoyable, particularly the longer the fan on the field can manage to evade capture… We really haven’t changed that much at all, it turns out. Who Really Invented the Sporting Wave? Did Nero Really Fiddle While Rome Burned?